All 48 of the city's operational outdoor rinks are now closed for the season. Note: the City of Toronto OPEN DATA portal has a page for outdoor rinks, but it only goes to 2016. March is no time to run most outdoor rinks because (1) the March sun is too strong, (2) so many people are sick of winter that even good ice gets few skaters, and (3) running outdoor rinks in March uses a shameful lot of energy. Since Feb.8, Sherbourne Common was listed as closed for unspecified "mechanical issues," and down to cement. Ramsden Rink did not run its refrigeration equipment for the season due to "unanticipated critical mechanical issues," unspecified. On January 15, city staff said they would maintain it as a natural ice rink, but that was very rare. The red flag is posted for Grenadier Pond. The city's outdoor rinks information website is usually accurate in good weather or very bad weather, but otherwise, often wrong. College Park trail said "delayed opening" with no date given. But it never opened at all. Closed for the season: North Toronto Memorial (for construction). Rivercrest was first listed as "delayed opening - Jan.2019 - mechanical issues," no details given, but was then changed to "closed for the season." List of Rinks and addresses. List of Unfenced Ice Rinks. Ontario’s accessibility act specifies that it applies to “Ontarians with disabilities,” but many people are not fond of such a negative descriptor. Just because I have arthritis in my knee and have trouble walking, for example, doesn’t mean I am defined in some broad way as DIS-abled. I just need to use a bike to get around instead of walking long distances. So I need curb cuts and good snow clearance in winter, when I bike to the park. Then I can get to where I want, just like people who get around by walking. Stopgap’s Luke Anderson, who uses a wheelchair, told us he prefers the expression “people who use wheels” to “wheelchair-bound.” When he spoke at the September 30 park meeting, Luke pointed out that the people who use wheels include parents and caregivers of babies, who use strollers – and therefore need curb cuts and good winter snow clearance and kneeling buses and subway elevators as well – or they can’t get around like people without strollers. Such adaptations are a win-win for everybody. Toronto is the world capital of mechanically-cooled outdoor rinks (we have almost 60), so that’s a lot of access – and fun – not allowed. 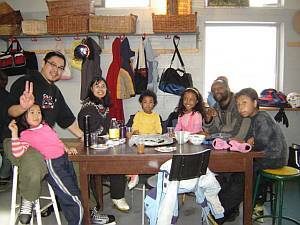 At Dufferin Rink, it never made any sense to the people who ran the rink to bar parents or caregivers of young children. So good skaters with babies in strollers have been able to skate here for most of the last 20 years. In that time, there has never been an accident involving a stroller. There’s been a lot of family fun, though. Dufferin Rink had a real-time experiment showing that strollers are not causing accidents – wonderful. But now strollers are once again not allowed on the rink. 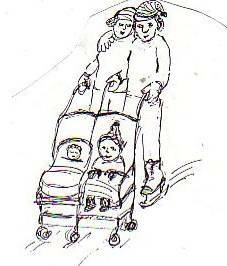 The law says Ontarians have the right to equal access if possible, and the 20-year Dufferin Rink experiment shows strollers are fine. It’s time for city authorities to change the rule everywhere. If not, then maybe it’s time for parents and friends of young children to make common cause with Luke Anderson and other people who use wheelchairs with the slogan – remove the barriers to participating in the social life of the community – for everyone. I have been corresponding with Todd Davison from Community Recreation at the City. He informed me that strollers are usually allowed on the ice if not being used as a skating aid and if the person is a confident skater. This is an issue he has been working on and he will let staff know about this. Excellent! Access for families with small children is back. City outdoor rinks: community gathering places or tourist destinations? Parks, Forestry and Recreation (PFR) was completely restructured in 2004. It takes time to turn a city department around, and this revolution took more than 10 years, getting everybody lined up going in the same direction. But now most of the job is done. Here's how this affected the city's 50 neighbourhood outdoor rinks. Recreationists, who in wintertime used to run skating classes and little hockey leagues and flip burgers at neighbourhood skating events, were renamed "community recreation programmers" and were set in front of computers to do data entry. Becoming virtual data entry clerks made many of them unhappy. But their wages were increased enough that pushing against this transformation -- with the risk of being fired -- raised the stakes. Most went along, the rest left. The staff re-structuring went with a re-definition of the "core values" -- now usually referred to as the "council-approved core business" -- of Parks and Rec. Consultants that were hired by the city recommended that most staff resources should go to registered fee-based programs rather than to drop-in places like outdoor rinks. Drop-in places were to be allocated only "minimal staff supervision." The recommendations seem to have been approved by city council as part of a bigger package. The "core business" approach translated into turning most front-line rink staff into -- essentially -- security guards. Their job is not to set up fun things at the rinks but to sit at a rink office desk or to patrol the rinks. They do a bit of cleaning and otherwise monitor the behavior of the rink users, recast as "customers." Since most rink users don't come to make trouble, new rules came out to keep the staff busy. Staff have to keep a close lookout for shinny hockey players and kids under 6 who are not wearing special CSA-approved hockey helmets, or who are taking photographs at the rink (not allowed). If skaters don't want to use a city-sanctioned helmet, or still try to take a photo, staff will eject them from the rink, and feel proud to have done their job exactly as outlined during their training. Having the outdoor rinks run by security guards has taken away a lot of the fun. Attendance is often sparse. This fact appears to be only slowly dawning on city management. It comes up at meetings, but so far, there's not much action. There's no signage at rinks for opening dates. The city's outdoor rinks website is often unreliable during unstable weather, but the city won't publish rink phone numbers so that people can check if the rink they want to go to is really open. 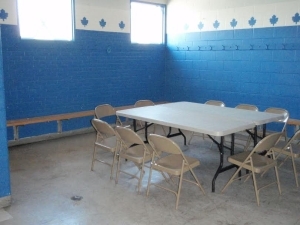 At some rinks, change rooms and washrooms may be locked on holidays. Some are not open on weekdays before 3, meaning school classes won't come. 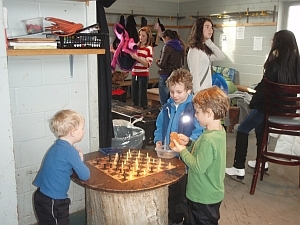 Change rooms are made only for skate/footwear changing, not for sitting and chatting with neighbours, or having a hot chocolate as part of the outing. With the exception of three rinks in Ward 18, no neighbourhood rinks have skate lending, because that's not part of the city's "core business." So a new kind of rink has started up as an alternative: the tourist attraction. The Bentway skating trail is an example. There's plenty of seating, skate lending, hot drinks and alcohol in a cafe/bar setting, warming tables with cozy gas fires, food trucks on weekends, DJ nights, performances, art shows. Tourists, from both outside and inside Toronto, are expected to come in large numbers. But it costs over a million dollars a year to run such a rink. Therefore, skate lending and drinks, priced to help cover that cost, add up to more than many ordinary families can afford. Plus: there's no shinny hockey! And the emphasis is on spectacle, not on making a community gathering place where near neighbors can meet in winter, as the outdoor rinks were meant to be. There's no sign that this reckoning has begun. Too many city staff are invested in the power that they have under the current system, top-heavy in management and meetings. So the waste of our rinks, and the more-than-$6-million-a-year in taxes to pay for them each year, will continue for now. City councillors will continue to be distracted by the glitter of mega-projects, instead of checking the pantry for useful resources we already have. Amplified music and ads from the Nathan Phillips skating rink, booming all over our civic square? "I am a cultural heritage specialist and conservationist who works in and around the GTA. I am preparing a paper to present at a heritage conference in Ottawa later this year on the impact that climate change is having on the Hockey Cultural Heritage Landscape.... Do you feel the weather has affected the viability of outdoor rinks or other hockey landscape features?" Attendance for drop-in shinny hockey at the city's mechanically-cooled outdoor ice rinks has been going down despite good ice. Fewer skaters are coming. The reason I mentioned declining attendance is actually not unrelated to climate change. It's kind of fascinating how much people rely on their news feeds (as well as the weather forecast apps) to make their plans. It's not unusual for people to say that they're sure the artificial ice rinks must be on the decline because it's too warm, and so they are switching, already now, to some other kind of physical activity, usually inside a gym. But the compressor-cooled outdoor rinks are not declining at all -- their ice is good most of the time. 1. When the cities amalgamated in 1997, rink staff had their season-start-up night-time ice-making shifts changed to daytime, i.e. they were sometimes trying to make ice in sunshine. Also, the ice-making days were shortened from 6 days to 3 days prior to opening date. Neither of those practices are considered acceptable in the ice-making industry, but they fit in better with staff holidays and trying to finish fall chores. So the rinks are often not open on time. The reason given is once again, "climate change." CC makes such a good excuse for every kind of poor workmanship. 2. 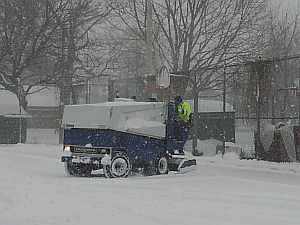 Until the cities amalgamated in 1998, the rink season in central Toronto was from mid-November until the end of February (from the time of the first A.I.R. 's in the 1970's). That's when (observation showed) the sun is weak and the rinks are best. Then in the past 5 or so years, for political reasons, the city councillors extended the rink season into mid-to-late-March. A staff report that showed low usage and bad ice in March seems to have been ignored. People see the mush and talk about how "climate change" is hurting the rinks. Here are some "lighter, quicker, cheaper" (LQC-type) fixes we proposed in our 2016 Outdoor Rink Report for some Toronto outdoor rinks. Scarborough Civic Rink in 2018? Giovanni Caboto Rink in 2017? 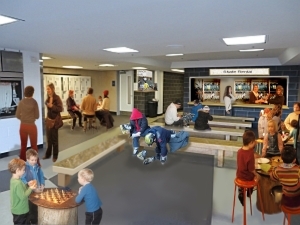 Knock out a wall, add some windows, snacks, and loaner skates. The empty market building could be used for skate lending. Each could be done for between $5000 and $30,000. But sadly, city hall wouldn't consider our report. The councillors message was effectively "go away." So for now we'll have to stop trying to help make rinks better. But we'll still document what rink users say, and what we see on rink visits. Simla Skating Club, in India. Their town is so high up in the hills that they need no machinery for the ice to stay frozen in winter. "120 pairs of donated skates inspiring Regent Park residents to hit the ice." Sub-headline: "Free skate-lending program only offered at 2 events in Regent Park this winter"
....with a partial story about skate lending,saying Councillor Layton "first proposed" the idea last week. Actually we sent him and 14 other councillors our skate lending offer on Sept.11 2017. But, who's counting? Jan.12, 2018: May Warren in the Star -- another follow-up to skate lending, with a headline turning Councillor Layton into the champion -- a shift from his previous stance. Jan.11, 2018 May Warren, in Metro News, a follow up about skate lending. Dec.29, 2017: CityTV "City website causing confusion over outdoor skating rinks closures." Dec.17, 2017, Globe, Andrew Savory, "Toronto gets three new skating venues"
Dec.7, 2017: Press Reader here. Dec.6, 2017: Metro News here. Nov.28, 2017: Edward Keenan from the Star give the outdoor rinks a plug. They included a reader questionnaire asking who's looking forward to using the rinks -- only 267 say they are. And in fact many of the outdoor rinks don't get much use. But there's a nice photo showing three guys (illegally) playing pond hockey on Ryerson Rink. Nov.20, 2017: CBC radio Here and Now afternoon show piece here. March 26, 2017 (Updated from June 26. 2012), Globe. Kelly Grant, "Auditor slams Toronto energy retrofit program"
Jan.23, 2017, CBC Radio, Metro Morning "How Toronto's skating rinks stay frozen even when temperatures rise" Quotes cityrinks.ca/CELOS information about the mechanics, and the parks director's description of a rink as a "giant refrigerator." Subject: Bargaining update: Raise the stakes - Take your breaks! Join us for a great skate on Family Day! On February 15, Locals 79, 416 and 4948 are hosting skating parties at rinks across Toronto. It’s a great opportunity for you and your family to get a little ice time while showing the public our dedication and commitment to the quality public services that make Toronto a great place to live. Nathan Phillips Square, Mel Lastman Square, Scarborough Civic Centre and High Park. There will be free hot chocolate, visits for the kids from some Minions and maybe even a Storm Trooper or two, and lots of fun. CTV News: "Skating Ban to be lifted at High Park's Grenadier Pond"
Toronto City Council voted 28-9 on Thursday in favour of a program that will allow skating on a designated area of Grenadier Pond next year... Doucette proposed that the city allocate $50,000 to hire an "ice engineer" who would test the thickness and quality of the ice on a daily basis, for a period of eight weeks. He or she would then post signs or flags to let skaters know when the ice is safe to use, and which parts of the pond are available for skating....Council voted in favour of the motion only after [Councillor] Doucette agreed to drop the funding request from $50,000 to $25,000. Instead of hiring an engineer, city staffers will be trained to do the tests. Weather permitting, legal skating will begin in the winter of 2016-17. "a one-time capital outlay of $192,000 and annual operating costs of $123,000, to cover “the services of an ice engineer and ice surveyor,” “de-naturalization of a portion of the eastern shoreline to ensure safe access,” “maintenance staff … maintain the ice surface,” yet more staff to provide first aid and keep skaters in their officially approved area, “purchase of required maintenance equipment such as a Zamboni,” “construction of a seasonal storage building,” a “safety perimeter boundary, a flag system, minor safety lighting and signage,” “seasonal washroom facilities and office space for staff.” So that people can skate on frozen water. Which they do anyway, every year it’s safe, without incident. It is beyond parody." Chris Selley "Keep the Bureaucrats off the Ice"
The city government has a staggering list of responsibilities. It issues 45,000 building permits a year and conducts 165,000 building inspections. Its paramedics answered 274,220 medical calls last year, while the year before its cops made 41,255 arrests. It maintains more than 4,000 emergency-shelter beds in 58 locations. The plain fact is that the city must either a) do fewer things for its residents, or b) ask them to pay more for what they get. On past evidence, it will opt to do c) neither, and get Tim Hortons to pay for ice rinks instead. Comment from CityRinks: There is a fourth option: do some better housekeeping of the outdoor rinks program. (1) Open the rinks as soon as the sun is low and people are excited about winter (mid-November). (2) Turn the rinks into more hospitable places, so that they’ll get maximum use during the skating season. That includes keeping the change rooms and washrooms open on all the stat holidays, and having more skate rentals. 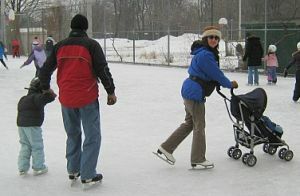 Staff can move the focus from rule-enforcement to fostering people’s enjoyment of skating, of the outdoors, and of wintertime neighbourhood sociability. (2) Then close the rinks when the sun gets too high for good ice, fuel costs go through the roof, and attendance drops off anyway (early March). Globe editorial "Skating rinks are an essential service." Toronto’s parks committee has moved to address recent criticism over the city’s ice skating policies, approving two motions that aim to make more outdoor rinks available, and for longer. On Wednesday, the committee approved a motion to create a contingency fund that would allow the city to extend its outdoor rink season in years when the weather is cold enough to do so. The committee also approved a motion that asks city staff to report back on the viability of allowing skating on Grenadier Pond in High Park. ...Councillor Gord Perks said the rules on donations and sponsorship are clear and the switch could have been avoided if the sponsorship deal had been vetted by city staff before they were announced. MLSE also has extensive dealings with the city, including a $10-million loan it received from the city last year for the expansion of BMO field. Asked whether city policies were followed in securing the donations, Mr. Tory said the corporate donors approached the city and details were worked out by city staff. He agreed measures need to be taken to avoid such last-minute fixes in the future. “I think we have to take a serious look at how many rinks we can keep open with city funds – knowing that they are not unlimited – through the school-break week,“ he said. The Star: editorial "Toronto should find money to keep its outdoor ice rinks open." The Star: "Corporate donors keeping 12 rinks open"
The Star: "Eleven Outdoor rinks will remain open until March 16"
CBC story and poll about skating on the pond. "Get out there and skate" by Peter Kuitenbrouwer. What is shinny hockey? A little film clip from Campbell Rink. Our rinks are community rinks. 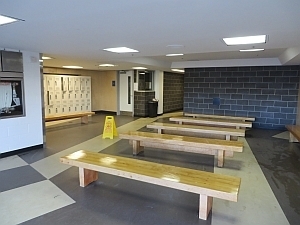 All members of the community are welcome to skate, play hockey, or meet their friends here. Rink staff would be pleased to answer any questions you may have about the programs and policies. Respect programs and permit times in designated areas. Do not use hockey sticks or pucks on the pleasure skating side. Leave the ice surface or any other rink area when asked to do so by staff. Put garbage in cans, not on the floor. Do not smoke in the rink house or on the ice. Be considerate of noise levels. Do not use foul, offensive or racist language. Do not fight or play roughly inside the building or on the rink surface. In case of a serious disagreement between rink staff and a rink user about any of these rules, the staff may ask the rink user to leave the rink until the matter is discussed with the Recreation Supervisor. If the rink user refuses the staff's request to leave the rink, a letter of trespass may result. Toronto has more outdoor mechanically-cooled rinks than any city in the world - 53. But our civic knowledge of the physics of ice maintenance hasn't kept pace with our collective rink wealth. Many people seem to find it amazing, even shocking, that outdoor rinks can be skateable when the air temperature is above freezing, as high as 11 or even 15 - during the low-sun months. What's the surprise? Collectively, as taxpayers, we spend about $500 a day at each rink to fuel the machinery that cools the rink pad. The rink compressors vary between 100 and 200 horsepower each. You can hear their noise through the compressor-room doors at the sides of the buildings. A brine (salt water) or glycol solution is pushed through a big tank of cooling ammonia, and then out into the extensive grid of PVC pipes underneath the concrete floor of the rink. The cold liquid brings the entire big concrete slab to well below freezing, so any water that's put on the surface of the rink pads sets up as ice right away. The brine liquid in the pipe grid circulates back into a large pipe in the "header trench" right next to the building, underneath where everybody stands when the zamboni is doing ice maintenance. From there the brine gets pushed back into the machinery room, where it passes through the freezing-cold ammonia tank, and out again into the pipes under the concrete, and so on. The only serious match for this powerful cooling system is the sun. In the months on either side of the December 21 winter solstice, the sun is very weak. It doesn't get to spend very much time above the horizon, and that suits the machinery just fine. By March, though, the sun is getting much higher in the sky, and the machinery often has trouble keeping the ice frozen at minus 4. Even on a sunny day at the end of February, when the air temperature is minus 8, the ice gets really mushy near the reflective boards, and a bit soft in the middle. The ice-making plant is losing ground as the sun prepares to bring on spring and summer. But on a low-sun Monday in November, even at 11 degrees, a thin film of water forms on top of solid ice, and the shinny hockey and pleasure-skating are brilliant. It's not only rink users whose rink literacy is in some need of upgrading. Over the years, some of the city's rink staff have also shown confusion. In our travels around the city's outdoor rinks, we have heard some zamboni drivers say in low-sun November that they can't make ice because the temperature is above zero. Over the years, the city's Parks management has blamed a multitude of ice-making sins on the temperature, global warming, etc. Convenient - but most of the time, not true. The mechanically-cooled rinks can do their job, and having all those rinks can take some of the sting out of the dark months of winter for Torontonians. But if the zamboni staff tell you that their zamboni sinks into the mush in early March, you'd better believe them -- or just take a look yourself. Here's an interesting history of mechanically-cooled ice rinks, written in 2004 by Ted Martin, then the general manager, Ontario Operations, with Cimco Refrigeration in Toronto. 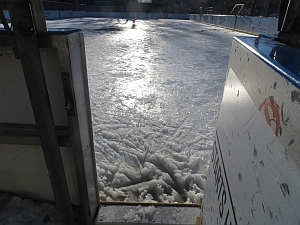 Read about better ways of stewarding our mechanically-cooled outdoor rinks here. 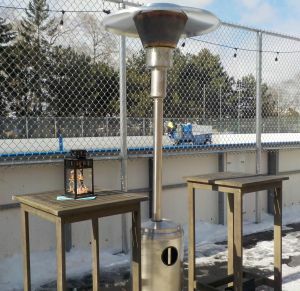 Many of Toronto's 52 compressor-cooled municipal outdoor rinks are bare-bones sports facilities, but some are also important wintertime social spaces for their neighbourhoods. People expect to meet acquaintances there, to chat and catch up on news as well as skating together. Double-pad rinks are more likely to have this function, since pleasure-skating is anytime there, not only in restricted time slots. 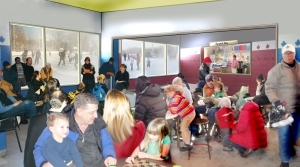 A few single-pad rinks have also become social spaces, either because of a particular location in a neighbourhood or because of programs (such as a weekly community supper) that maximize the friendship possibilities of the rink. Double-pad rinks that are also neighbourhood social spaces (to widely varying degrees): Rennie, High Park, Dufferin, Wallace, Harry Gairey, Otter Creek, North Toronto Memorial, Hodgson, Ramsden, Dieppe, Greenwood. 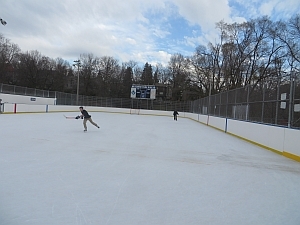 Single-pad rinks that are also social spaces: Buttonwood, Colonel Sam Smith Skating Trail, Valleyfield, Wedgewood, Ledbury, Campbell, Cedarvale, Christie Pits, Kew Gardens, Withrow. 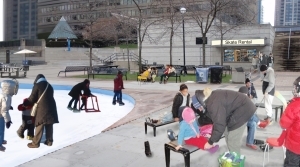 Harbourfront's Natrel Rink (not municipal) is both an entertainment venue and a social space where friends often arrange to meet. The wintertime social meeting-up function of rinks needs to be better recognized, and fostered, than it is at present. The science is there, the history is there (pre-amalgamation), professionals say it can be done, Harbourfront is doing it, even volunteers have done it. This list supplies the fundamentals of ice making. A few rinks have a direct line. Go to the individual rink profile through the Quick Links.